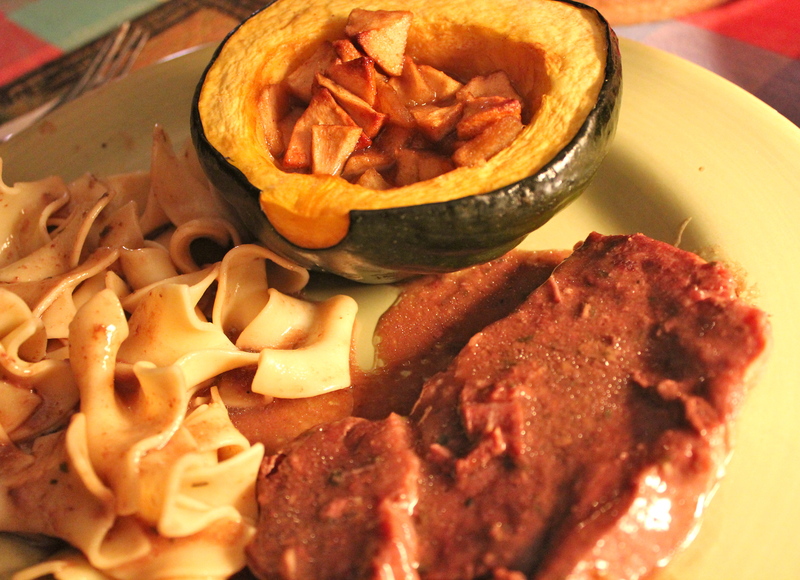 Slow cooker blade steaks served with noodles and acorn squash. Today was one of those days when I am very glad that I have a slow-cooker. Busy, Busy, Busy! But I was still able to put an attractive and very tasty meal together and my husband and I really enjoyed it. The only time I spent on it was to saute the onions before putting everything in the crock pot early in the morning, and as the saying goes “set it and forget it”. This recipe was originally written using a pot roast which I often do make, but today I used blade steaks instead and got an extremely tender and flavorful result. You will note that the recipe calls for adding carrots and potato to the slow cooker with the meat, but for today I cooked some wide egg noodles to go with it. The recipe produces a good quantity of gravy and so its good to have some thing that will go with the gravy like mashed potatoes or noodles. To produce a successful meat in the slow cooker you need something to give lots of flavor; in this case sun-dried tomatoes, herbs and garlic. You will also be using less liquid than oven or stovetop versions, but the moisture in the slow-cooker plus meat juices will contribute to the gravy. 1. To prepare meat: sprinkle steaks evenly with salt and pepper. 2. Spray the interior of the cooker insert with non-stick spray. Place the meat in the cooker. 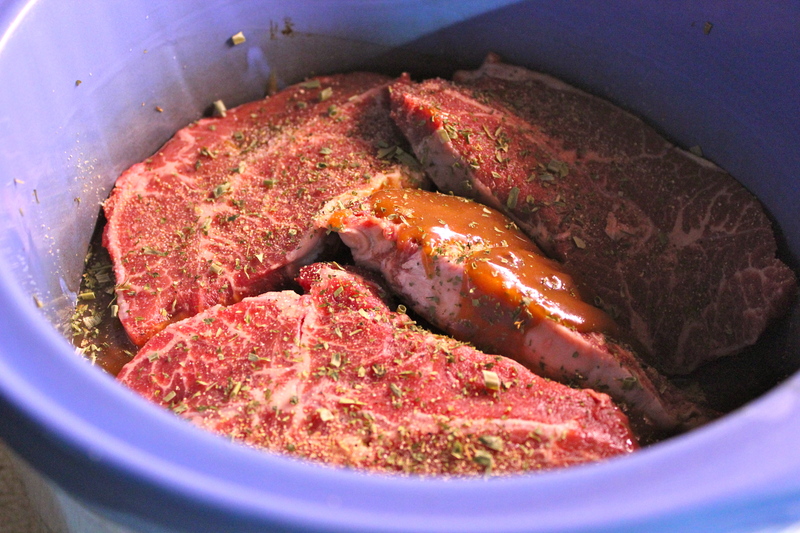 Blade steaks in the slow cooker insert. 3. In a skillet, add olive oil, then onion and sauté 6-8 minutes or until lightly browned. Add the broth and next ingredients through bay leaves. Bring to a simmer. Add the broth mixture to the slow cooker. If using vegetables, arrange them around the meat. Cover and cook 2 hours on HIGH, reduce heat to LOW and cook 4 hours more. Or start on LOW and cook 6-8 hours. 4. To serve, remove bay leaves and discard, serve with the gravy. 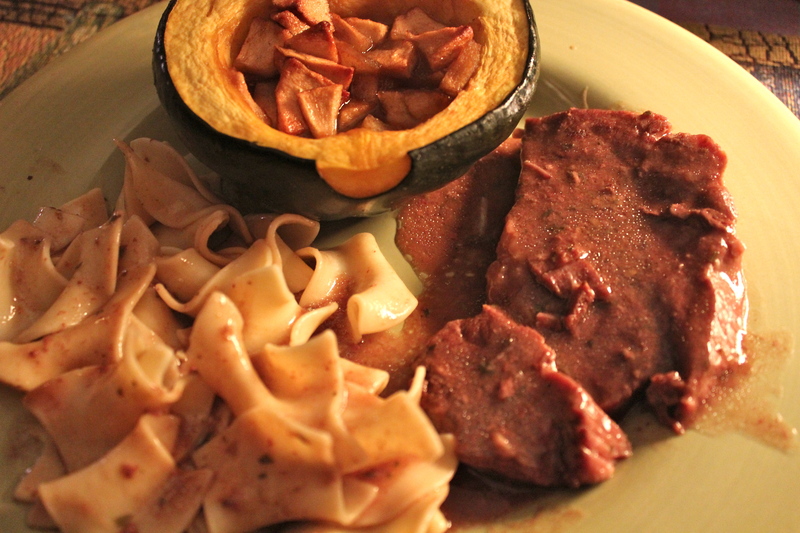 Blade Steaks with gravy , noodles and stuffed acorn squash.